Researchers are attempting to help the U.S. dairy industry decrease its carbon footprint as concentrations of carbon dioxide in the Earth’s atmosphere reach record levels. A report by Gregory D. Miller (President), and Ying (Director of Sustainability Research) refers to the work (in the first annual U.S. Dairy Sustainability Commitment Progress Report) as "framing a roadmap of research, tool development, and knowledge sharing. "Life Cycle Assessment (LCA) is the leading framework to better understand, measure and reduce environmental impact — and the only one designed to provide a full evaluation of all sources and types of environmental impact at every step of a product's life cycle. "Because of the complexity of the dairy industry and the comprehensiveness that LCA demands, the U.S. dairy industry began their work with a green house gas (GHG) LCA for milk. Whole milk production represents one-third of the dairy market, and the GHG fluid milk LCA serves as a foundation for analysis of other dairy products, packaging, and delivery system." The report also refers two examples: "to examine additional impacts appear in Matlock et al. 's geospatial analysis of water impacts from U.S. dairy production and Leh et al. 's assessment of ecosystem service loss as a result of land changes. "Matlock et al. begin the complex process of analysing water impacts including use, water stress, and eutrophication. These impacts are regional and location-dependent, but also extend into the entire watershed (catchment - New Zealand) in which the dairy is located. 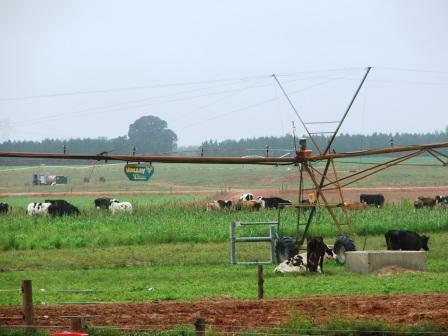 The study finds that feed crops – irrigation water use and fertiliser run-off – may present the biggest water impacts for dairy production system. "Leh et al. examine the impact of land use changes in an agricultural watershed in Northwest Arkansas between year 1800 and 2006. The authors found that on the field level, dairy operations resulted in reduced land use change on ecosystem service loss, compared with the overall watershed (catchment - New Zealand). "The body of work presented in this special issue of the International Dairy Journal is a first example of the exciting projects being undertaken by the Innovation Center for U.S. Dairy. Due to these efforts, the dairy industry is now further advanced than nearly any other industry in identifying the sources of its environmental impact and identifying solutions," the report says. Read the full report here and more here. 1. U.S. Dairy Sustainability Commitment Progress Report, December 2010. Accessed here. 2. Innovation Center for U.S. Dairy, www.usdairy.com. 3. University of Arkansas and Michigan Technical University, Fluid Milk Carbon Footprint Study Executive Summary, October 2010. Accessed at here. 4. Greenhouse Gas Emissions from the Dairy Sector: A Life Cycle Assessment. Food and Agriculture Organization of the United Nations, Animal Production and Health Division, 2010.